The man who carried out the sensational robbery at the Colombo National Museum in March this year, has claimed that if he had the wherewithal, he would have carried away Sri Wickrama Rajasinha’s throne, along with the other items he removed in the heist. The suspect CID officials arrested last week, while he was loitering on the beach in Negombo, has confessed to being a heroin addict driven to rob the Museum, believing he could make enough money to support his addiction for many years to come. CID officials tracked down the 34-year-old man, who was a regular ‘handy man on’ construction sites, after he had exhausted over Rs 2 million of the proceeds from the sale of the stolen goods. The breakthrough came following a telephone call the suspect made to his mistress in Galgamuwa. 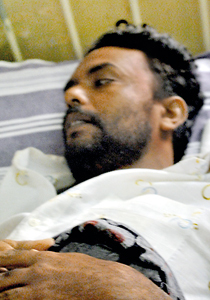 Police tracked down the number to Negombo, where he had taken up temporary residence, since the robbery in March this year, to escape arrest. From the details that have emerged so far, the man has confessed to a solo operation with no accomplices. The idea of robbing the Museum’s artefacts had first crossed his mind when he paid a visit there with his mistress. He and been impressed with the gems and gem embossed artefacts displayed there and realised they were worth a large amount of money. Since he had worked as a handy man in the construction of a house being built opposite the Museum, he had closely observed the opening and closing times of the Museum and the movements of the security personnel on duty. He had noticed that, on most days, the security personnel on duty were asleep and that security was lax, so that, anyone could enter the premises at night, without being detected. After observing these activities at the Museum, he made a second visit to the Museum, this time wearing a cap with its peak at eye level. Once inside, he noted locations of the security cameras. He tampered with some of the artefacts to see if the security personnel would be alerted, and realised that the security cameras were not operational and only installed as a deterrent. On the day of the robbery, he visited the Museum once again towards evening. He carried a bed sheet and a an iron rod concealed in his person. Once again wearing a cap. As the visitors were leaving towards closing time, he hid behind a long wooden cupboard on the first floor of the building, until the complex was locked up for the day. Later, he had come out, laid the bed sheet on the ground, and slept for a few hours, before waking up around 2.30 am to carry out the robbery. The suspect had told the CID that he had decided to take the items which had gems embossed on them, including the swords and the coins. He had wrapped the swords at one end of the bed sheet, and stuffed the items inside his clothes. He then tied the other end of the sheet to a window bar and climbed down. Halfway down, the sheet tore apart and he fell to the ground. The sound of swords crashing down, one on top of the other made a loud noise which frightened him. He stayed still at the scene for several minutes, fearing that the security guards would have been alerted. Instead, to his surprise and relief, there was total silence all around, confirming that the alarm had not been raised. Quickly he collected the swords and escaped through the rear entrance of the Museum, unchallenged.He later travelled to Weligama and sold all the items to a three-wheeler driver, a middleman dealing in buying and selling such goods. The middleman later sold some of the items to four persons, all of whom are now in police custody. A sword embossed with gems had been sold to a man in Kotahena, now identified as a notorious thug in the area. He had been arrested by police about two months ago, in connection with a kidnapping case. Soon after the arrest, fearing their house would be searched, the wife of the Kotahena man had collected several rings, some gems and several pieces of a sword which had been hidden in the house, and gave it to a three-wheeler-driver friend. 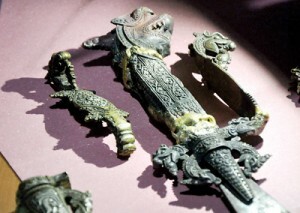 The sword, said to belong to Nugawela Adikaram, had been severed into three pieces and hidden. Police were tipped off by the three-wheeler driver who was suspicious about the goods . Subsequently, the Kotahena man was questioned about the goods, which led to the arrest of the man in Weligama, to whom the chief suspect had sold the goods. This put the police on his trail, which culminated in the chief suspect’s arrest last week. Police found the man had used 17 different SIM cards between March and October this year to avoid detection. He had confessed to using up to two gm of heroin a day, which costs him around Rs 20,000 per day. He also bought a Dimo Batta lorry, while the rest was spent on drugs. The Museum robber stole one of five rare coins (Ada Kahavanu), Dr Kavan Ratnatunga who probed the current condition of the coins and currency losses, told the Sunday Times. “The lost coin is the only Ada Kahavanu we had in the Museum, and there are only five such coins in the world,” Sri Lanka Numismatist Society President Dr Kavan Ratnatunga who was appointed by the Colombo Museum to investigate the current condition of the coins and currency collection of the museum, told the Sunday Times. This coin alone is clearly worth more than Rs 4 million, more than all the other stolen artefacts taken together. “It is the biggest loss in the robbery” he revealed. He considered the Ada Kahavanu to be more important than the Carnelian semi precious stone with carved female figure belonging to the first century AD. A Kastane, two rings, a carnelian gemstone with microscopic carving of a female figure, 13 currency notes issued after independence and small grain-like semi-precious stones are among the recovered artefacts. According to the Colombo National Museum’s Superintendent Ranjith Hewage, a rare, priceless Ada Kahavanu, a gold coin of the late Anuradhapura era of medieval Sri Lanka, 146 coins including gold coins, around 20 currency notes belonging to the British colonial era, 7 gold-plated Kastane, a type of short ceremonial sword typical to Sri Lanka, including one used by Nugawela Adikaram, a Kandyan Chieftain, are yet to be recovered. Three gem-studded walking sticks and a belt made out of golden threads, also used by Nugawela Adikaram, are still missing.